The EMS Young Scientist Award 2015 is awarded to Miguel Potes from the University of Evora, Portugal, for his publication: “Satellite remote sensing of water turbidity in Alqueva reservoir and implications on lake modelling”, M. Potes, M. J. Costa and R. Salgado; Hydrol. Earth Syst. Sci., 16, 1623–1633, 2012, www.hydrol-earth-syst-sci.net/16/1623/2012/, doi:10.5194/hess-16-1623-2012. 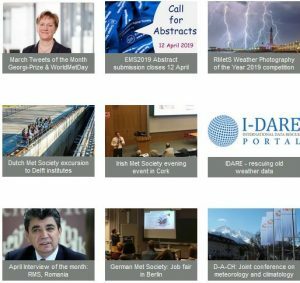 Miguel will give a Young Scientist Award Lecture on his work at the EMS Annual Meeting & ECAM in Sofia, in session OBS1/ASI8 Atmospheric measurements from the local to the regional scale: Concepts, new technologies and scientific progress: How lakes influence the local atmospheric circulation. Miguel Potes graduated in Meteorology, Oceanography and Geophysics at the Faculty of Sciences, University of Lisbon in 2006. He joined the Evora Geophysics Centre (CGE – http://www.cge.uevora.pt/en) in 2008 after having received a Master’s degree from Evora University with a thesis on “Climate and water quality on Guadiana basin”. Miguel Potes finished his PhD in 2013 with a thesis entitled “Remote sensing and in situ determination of physical and micro-biological parameters of inland waters and its application on lake-atmosphere modelling”. In 2014 Miguel has been involved in a study on the interface between meteorology and physical limnology, in particular applying his knowledge to inland water bodies such as the Portuguese Alqueva basin, the largest artificial reservoir in Western Europe, trying also to understand the impact in the surrounding atmospheric environment. He was one of the key organisers of an international intensive measurement campaign on lake-atmosphere interaction which took place in the south of Portugal, namely the ALqueva observational EXperiment in 2014 (ALEX2014 – www.alex2014.cge.uevora.pt) which resulted in an interdisciplinary database useful for researchers working on Alqueva reservoir, but also for the national scientific community. This field campaign improved the knowledge about energy and mass fluxes between large reservoirs and the atmosphere and about the development of thermal circulations on semiarid Mediterranean conditions. 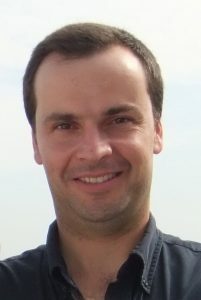 In 2015 Miguel Potes was member of the organising committee of the fourth Workshop “Parameterization of Lakes in Numerical Weather Prediction and Climate Modelling” (http://www.lake15.cge.uevora.pt/), co-organised with the WG3 meeting of COST Action ES1404, held in Institute of Earth Science (ICT – institute formed in 2015 with CGE and other two Portuguese groups) and Evora University. As a postdoc at ICT Miguel Potes is now focused on the development of a portable underwater apparatus for measurements of spectral downwelling irradiance profiles in order to obtain the attenuation coefficient of light for different types of water bodies. These in situ measurements intend to be a valuable tool for satellite remote sensing calibration of some surface products related to water reflectance and transparency. The Award will be presented at the EMS Annual Meeting on Tuesday 8 September 2015 in the Awards Session.